15 % of all injuries of the elbow joint lead to occupational disability with a premature pension. Thus, it is understandable that the health system has great interest to limit the consequences of such injuries, in case previous prevention measures have failed. Hence, there is a need for physicians and therapists who invariably master the (functional) anatomy and pathology of the elbow joint, so patients with elbow lesions would be treated appropriately. 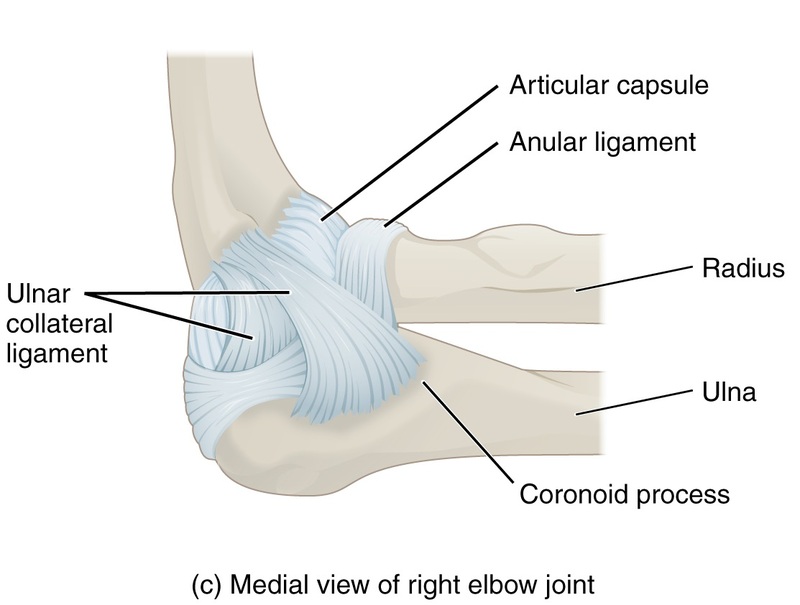 This article is supposed to help medical students to learn the routine of dealing with the elbow joint – both for the exams in university and for later professional practice. 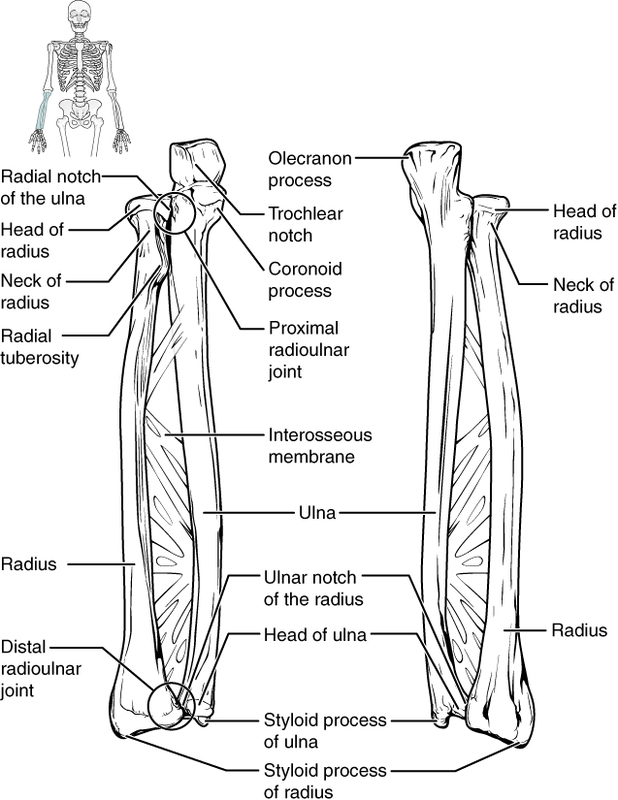 Note: The distal radioulnar joint is part of the wrist and not of the elbow joint. The elbow joint is capable of extension and flexion, as well as pronation and supination. Adduction and abduction cannot actively be performed and are rather considered as gapping via passive structures if the elbow is flexed or extended. The greatest degree of motion is observed at flexion, with the extension being the returning movement. Due to the osseous inhibition via the olecranon, extension movements exceeding 0 degrees are rare and are mostly seen as hypermobility. The following image illustrates this composition. The trochlea of the humerus is the osseous connection of the distal humerus to the ulna. Its medial diameter is greater than its lateral one, which leads to inward rotation of the ulna at the extension of the elbow joint. The trochlea features a groove for movements of the ulna. The ulna itself has an influence on the final position of elbow flexion, e.g. at proximal-lateral courses, the lower arm has a lateral orientation. If the course should be proximal-medial, the lower arm’s final position is medial, respectively. The kind of the course is different from person to person and is not considered pathological, as long as flexion movement is not conspicuously impaired or painful. In the anterior to posterior orientation, the trochlea is convexly formed; it is flat in the medial-lateral orientation. The coronoid fossa is situated proximally of the trochlea of the humerus and forms the proximal articulating partner of the humerus to the distal ulna. Its task is to articulate with the coronoid process of the ulna at the flexion of the elbow joint. The medial epicondyle of the humerus is an osseous medial protrusion of the distal humerus. Amongst others, it serves as the bony origin for the hand flexors. The supracondylar ridge is a crest-like edge, which originates from the medial epicondyle of the humerus and runs proximally. It serves as the origin or insertion of the brachial muscle, the pronator teres muscle, the medial belly of the triceps brachii muscle, and the medial brachial intermuscular septum. This osseous groove lies dorsally of the medial epicondyle of the humerus and serves the distally running ulnar nerve as a guiding structure. The olecranon fossa is located proximally and dorsally to the trochlea of the humerus. It is filled with fatty tissue and forms the proximal articulating partner of the humerus to the distal ulna. Its task is to articulate with the tip of the olecranon of the ulna at the extension of the elbow joint. The articulating surface of the ulna to the humerus is known as the trochlear notch. It faces ventrally and surrounds the trochlea like pliers, which can explain the hinge-like movement of flexion and extension of the elbow joint. The trochlear notch dorsally ends with the olecranon. This osseous protrusion is prominent and well palpable. The olecranon process of the ulna fits into the olecranon groove of the humerus when the arm is fully extended. It serves as the insertion for the triceps brachii muscle and as the origin of the ulnar belly of the flexor carpi ulnaris muscle. The coronoid process of the ulna – not to be mistaken for the coronoid process of the mandible – is a prominent triangular bone protrusion of the ulna and forms the distal part of the trochlear notch. Its medial part is the origin of the superficial flexor digitorum muscle and the pronator teres muscle. The tuberosity of the ulna, which is the insertion point of the brachial muscle and the origin of the superficial flexor digitorum muscle, is located distally from the coronoid process. Dorsally to the trochlear notch, is located the supinator crest, which represents the origin of the supinator muscle. The joint capsule surrounds the olecranon fossa of the humerus from the dorsal direction and the coronoid fossa from ventral. However, the medial epicondyle and the groove for the ulnar nerve lie outside of the capsule. Parts of the joint capsule grow together with deep fibers of the medial collateral ligament. On the ulna, the joint capsule inserts at the bone-cartilage border of the trochlear notch and surrounds the radial notch of the ulna from the medial direction. Dorsally, the capsule surrounds the olecranon fossa along with two more connective tissue strands. In its course, it forms small dorsal and ventral recesses. At flexion, the dorsal parts are tense and the ventral capsule parts are tense at extension, respectively. For the humeroulnar joint important are the ulnar collateral ligament and the epicondylar ligament of the olecranon. This ligament has four fiber strands: anterior part, posterior part, medial part and transverse part. In all joint positions, sections of them are tense and stabilize the humeroulnar joint against valgus stress. The ligament relaxes at extension and pronation. This is a splitting-off of the ulnar collateral ligament and has the function to stabilize the ulnar nerve in the sulcus of the ulnar nerve. 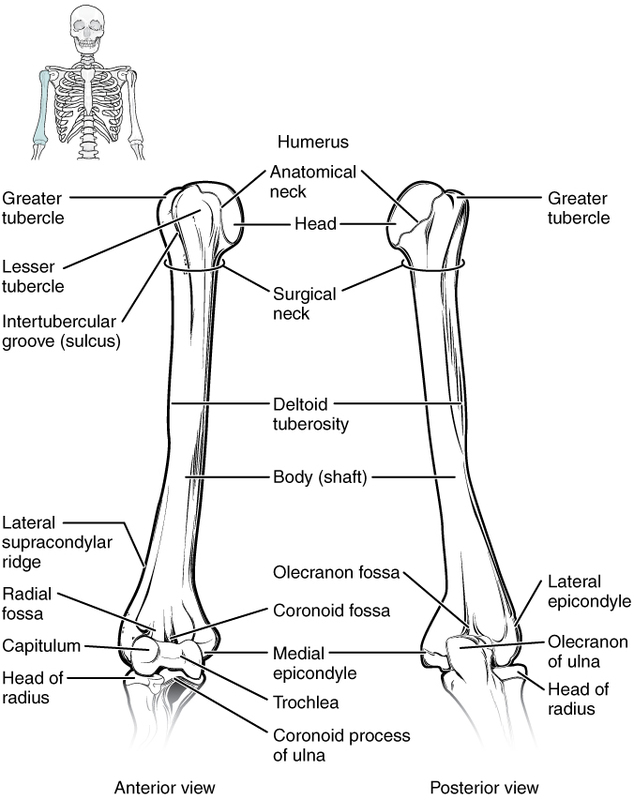 The following osseous structures of the humerus are relevant for the humeroradial joint. The capitulum is the lateral circular articular part of the distal humerus that articulates with the head of the radius. The capitulotrochlear groove separates the capitulum from the trochlea of the humerus. The oblique lunula of the radius moves through this groove at all movements of the elbow joint. The radial fossa is situated proximally and ventrally to the capitulum of the humerus. Its task is to articulate with the head of the radius at the flexion of the elbow joint. The lateral epicondyle of the humerus is located laterally to the capitulum of the humerus and serves as the origin for the lateral collateral ligament and for the hand/finger extensors. The lateral supracondylar ridge begins at the lateral epicondyle of the humerus and runs proximally. It is the insertion point for the brachioradialis muscle, for the extensor carpi radialis muscle and for the intermuscular septum. The fovea articularis radii are the radial articulating surface for the humerus. It is oval and concave and, thus, functionally defines the humeroulnar joint as a concave joint. The oblique lunula of the radius is a marginal bulge of the fovea articularis radii. It shifts in the capitulotrochlear groove at all movements of the elbow joint. The joint capsule surrounds the radial fossa of the humerus, whereas the lateral epicondyle of the humerus remains outside of the capsule. On the radius, the insertion of the capsule lies distally to the bone-cartilage border of the articulating circumference of the radius. Dorsally and ventrally, the capsule forms several small recesses. The ventral capsule parts are tense at elbow extension, whereas the dorsal parts are respectively tense at flexion. Only the radial collateral ligament is relevant for the humeroradial joint. The radial collateral ligament splits into two V-shaped parts where one rein runs ventrally and the other dorsally. The task of this ligament is to stabilize the elbow joint against varus stress. 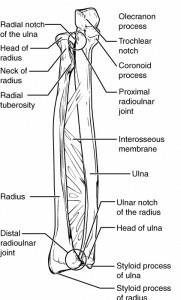 The most important osseous structure of the proximal radioulnar joint is the head of the radius, the caput radii. Facing the ulna, there is the articulating circumference of the radius, which articulates with the ulnar joint surface and with the annular ligament of the radius. Roughly 2-3 cm distally to the proximal radius edge is located the tuberosity of the radius, the insertion point of the biceps brachii muscle. 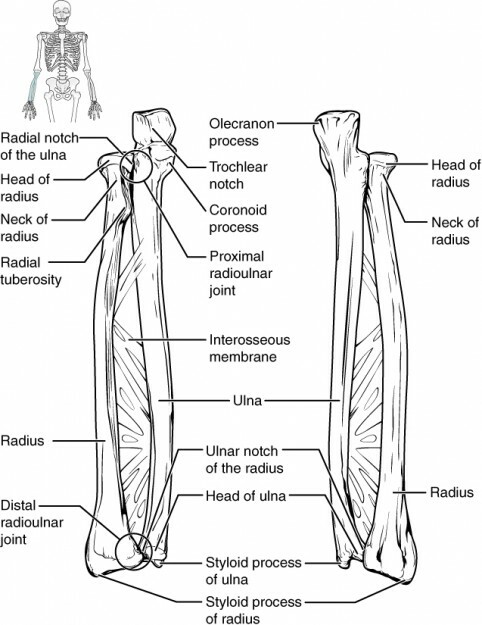 On the lateral side of the ulna, there is the radial notch of the ulna which articulates with the radius. From the dorsal edge of the radial notch of the ulna emerges the supinator crest of the ulna emerges which is the origin of the supinator muscle. The ulnar part of the joint capsule begins at the radial edge of the trochlear notch and transits into the radial notch of the ulna at the bone-cartilage border. On the radius, the capsule begins below the bone-cartilage border of the circumference and includes the annular ligament of the radius. Distally to the ligament, there is a recess of the joint capsule – the so-called sacciform recess. Concerning the proximal radioulnar joint, the annular ligament of the radius and the quadrate ligament should be mentioned. The annular ligament of the radius surrounds the head of the radius but omits the oblique lunula. In the middle position between pronation and supination position, it is tense. It forms an articulating surface for the circumference of the radius and centers the head of the radius towards the ulna. This ligament is not present in every person. 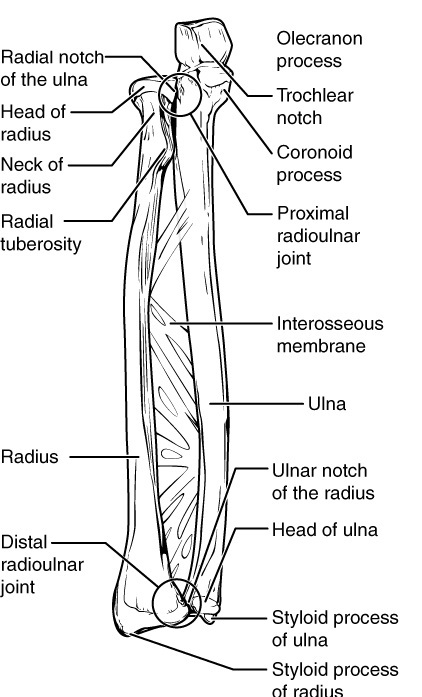 If it is inherent, it is grown together with the joint capsule of the proximal radioulnar joint and, thus, forms a connection between radius and ulna. Furthermore, it can be connected to fibers of the annular ligament of the radius on the ulnar side. Therefore, it can assume the same functions, although rather weakly. The capsule-ligament apparatus of the elbow joint is closely occupied by several receptors and, thus, has great proprioceptive features. Unfortunately, this brings the disadvantage of neuronal deficits to massively impair movement control of the joint. 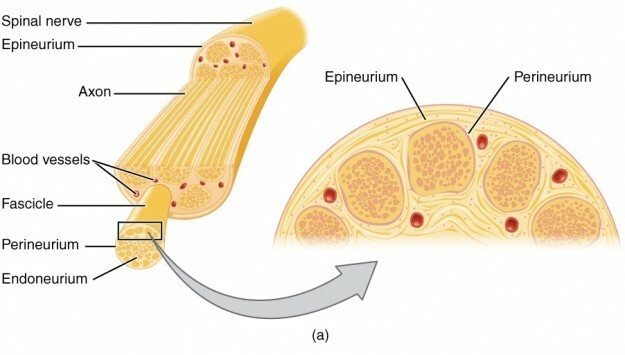 Concerning innervation, one has to distinguish between the dorsal and ventral capsule-ligament apparatus since they are innervated by different nerve fibers. The ulnar nerve gives rise to an articular ramus to the dorso-medial elbow joint while the radial nerve supplies the dorso-lateral capsule-ligament apparatus with a joint branch. The cutaneus antebrachii nerve supports the radial nerve at its supply of the dorsal region. Also, subfascial rami out of the muscular rami (anconeus muscle) innervate the joint capsule of the humeroradial joint. The median nerve supplies the ventro-ulnar region of the elbow joint with joint rams. Furthermore, the musculocutaneus nerve innervates the ventro-radial joint area with an articular ramus (lateral cutaneus antebrachii muscle). In this section are discussed the most important aspects of the functional anatomy of the elbow joint. Primarily described are the axis and plane positions, or the angular positions resulting from them, which are essential for movement sequences of the joint. The proximal and distal ends of the humerus are twisted against each other. The retroversion angle resulting from this fact develops via the transversal axis of the epicondyles and the line, which connects the center of the major tubercle with the head of the humerus. While this torsion angle is roughly 60 degrees in infants it is ca. 20 degrees in adult human beings. The trochlea and the capitulum of the humerus are ventrally angled from the shaft axis. In an adult person the angle amounts to ca. 45 degrees. Literature does not give information if the angle is smaller or larger in infants. Note: Due to the retroversion and diaphysis angle, the elbow joint is functionally better aligned in the ventral orientation than in the dorsal one. Together with the shaft axis, the line between the tip of the olecranon and the coronoid process forms the ulnar joint angle. In an adult person, it is roughly 45 degrees. Literature does not give information if the angle is smaller or larger in infants. Note: This angle position explains the great capability of flexion of the elbow joint. The elbow joint has a great factor of pathogenicity, and thus possible lesion forms are manifold, so this article only covers the clinical pictures that are most frequent in practice. This kind of fracture of the upper arm with joint participation primarily occurs at falling on the maximally extended arm. It is divided into supra-, trans-, or intercondylar fractures. Depending on the location and the extent, these injuries have to be reduced and surgically treated. Plate osteosynthesis mostly represents first-line therapy. 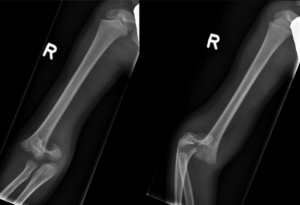 In contrast to the humerus fracture, the olecranon fracture mostly occurs at falling on the flexed arm. Besides the simple fracture, complicated forms can develop, at which the olecranon tears off or breaks into several fragments. This injury form is usually treated surgically with a tension band osteosynthesis. The radial head can be fractured at falling on the extended arm. This injury form can occur with or without dislocations or as multiple fragment fracture. While the multiple fragment fracture is treated surgically, the other lesion forms can be treated conservatively. This is also called Nursemaid’s elbow or radial head subluxation. Abrupt longitudinal traction on the radius with rotation (as it occurs if parents brutally pull their child on the arm and the child turns away) makes for the radial head to completely or partially translated into the sacciform recess, loosening from the annular radial ligament. This way, the radial head subluxates and the annular radial ligament is painfully clamped. Due to pain and malposition, neither active flexion nor extension is possible and the arm is held in a pronation relieving position. This gives the impression of a neuronal paralysis which is practically not present. As soon as the radial head is professionally repositioned by a physician, the symptoms mostly disappear quickly. The two main methods for reposition are hyperpronation and a combination of supination and flexion. 1. Which of these statements concerning the elbow joint is correct? 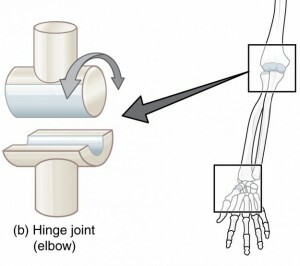 The elbow joint is movable in all axes and planes. The distal radioulnar ligament is part of the elbow joint. 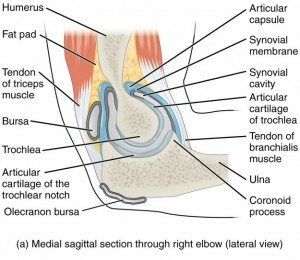 The nerval capsule-ligament supply occurs via the ulnar nerve, the radial nerve, the posterior cutaneus antebrachii nerve, and the musculocutaneus nerve. Flexion has the greatest extent of movement in the elbow joint. 30 % of all elbow injuries result in occupational disability with a premature pension. 2. What is the extent of the retroversion angle of the humerus in adults? 3. Which relieve position does a patient with Chassaignac’s paralysis show? He does not show any relieve position since it is a paralysis. Bain, G. I., & Mehta, J. A. (n.d.). 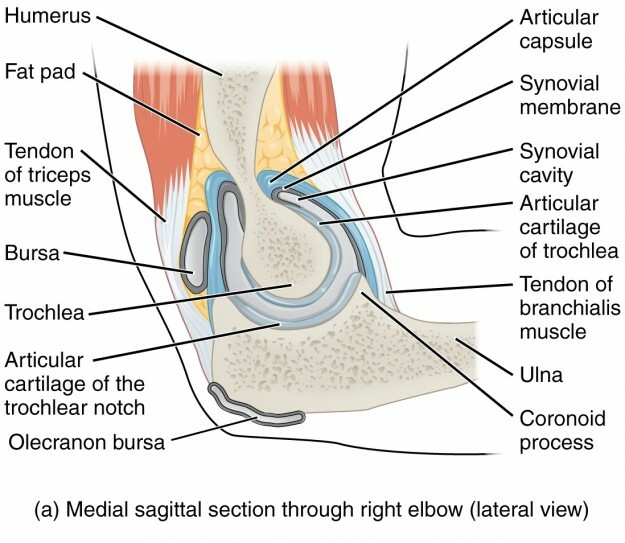 Anatomy of the Elbow Joint and Surgical Approaches. Operative Treatment of Elbow Injuries,1-27. doi:10.1007/0-387-21533-6_1. Morrey, B. F. (2009). 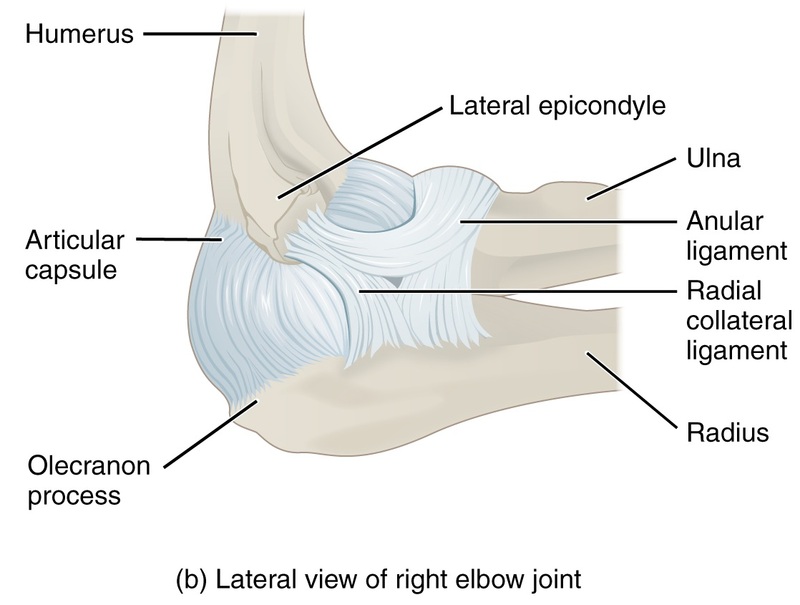 Anatomy of the Elbow Joint. Morreys The Elbow and Its Disorders,11-38. doi:10.1016/b978-1-4160-2902-1.50007-3. Pansky, B. (1996). Review of gross anatomy. New York: McGraw-Hill, Health Professions Division.